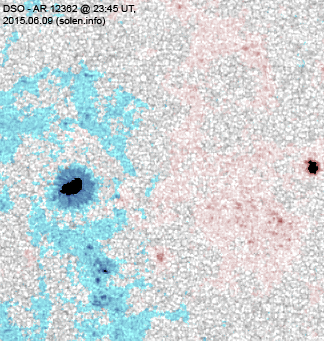 Last major update issued on June 10, 2015 at 04:45 UT. The geomagnetic field was quiet to active on June 9 due to effects from CH671. Solar wind speed at SOHO ranged between 563 and 684 km/s. 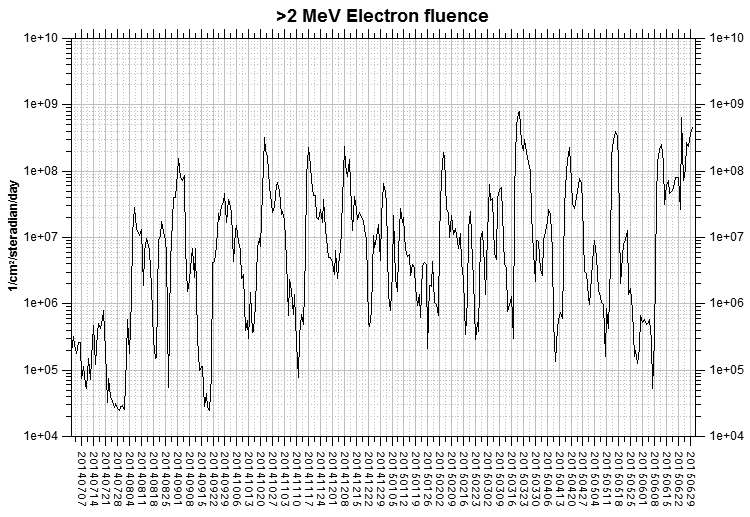 Solar flux at 17h UTC on 2.8 GHz was 131.4 (decreasing 25.6 over the last solar rotation, the measurement at 20h UT was flare enhanced). The 90 day 10.7 flux at 1 AU was 125.5. 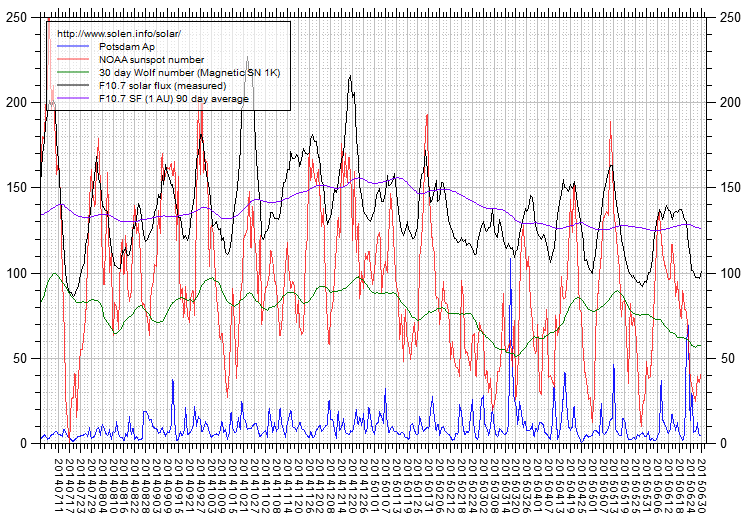 The Potsdam WDC planetary A index was 14 (STAR Ap - based on the mean of three hour interval ap indices: 14.0). 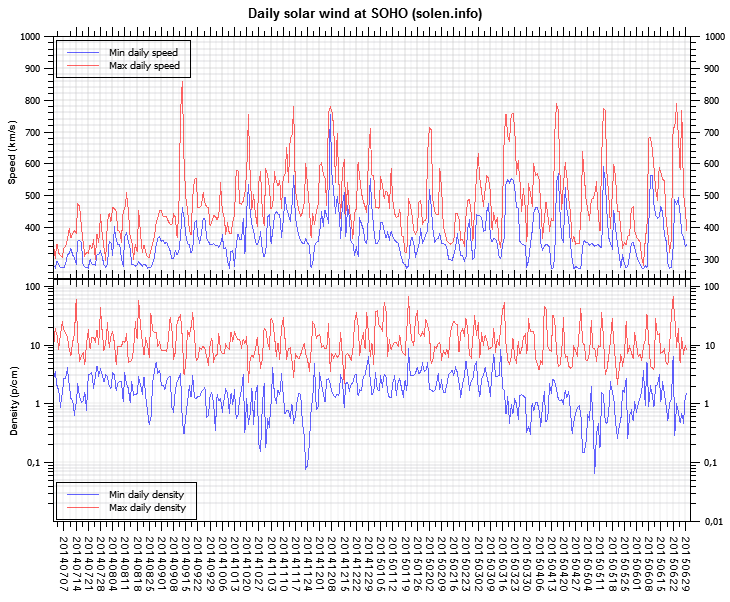 Three hour interval K indices: 43323332 (planetary), 43333*** (Boulder). At the time of counting spots (see image time), spots were observed in 12 active regions using 2K resolution (SN: 243) and 8 active regions using 1K resolution (SN: 143) SDO images on the visible solar disk. Region 12360 [N15W30] decayed slowly and simplified magnetically. C class flaring is possible. Region 12361 [N19W02] decayed slowly and quietly. Region 12362 [N07E03] was quiet and simplified magnetically. 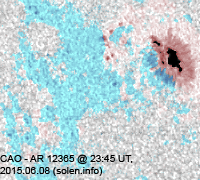 Region 12364 [S05E24] decayed slowly producing a low level C flare. This is a reversed polarities region. Region 12365 [S13E21] decayed slowly and quietly. The region has reversed polarities. Region 12366 [N17E19] was quiet and stable. S4530 [N13E13] reemerged with penumbra spots. S4531 [S07E32] lost the trailing spots and was quiet. New region S4532 [N07E15] emerged with penumbra spots. New region S4533 [S32E50] emerged with a penumbra spot. 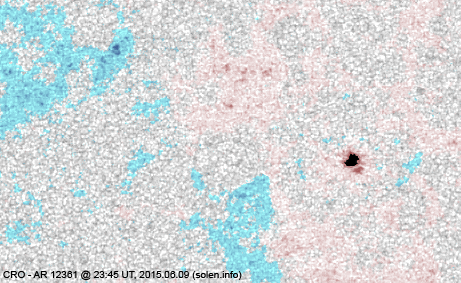 New region S4534 [S22E00] was observed with a penumbra spot. New region S4535 [S07E04] emerged with penubmra spots. 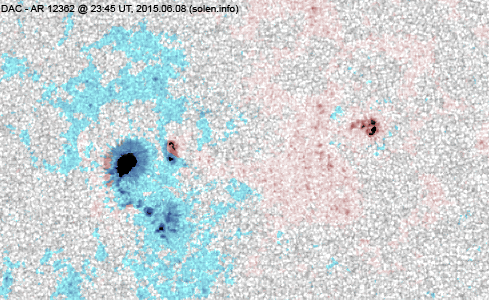 C2.8/1F 20:01 S04E24 12364 GOES15 CME? June 7-9: No obviously Earth directed CMEs were observed. In limited imagery a CME was observed mostly off the east and northeast limb late on June 9. This may be associated with the C2 event in AR 12364. 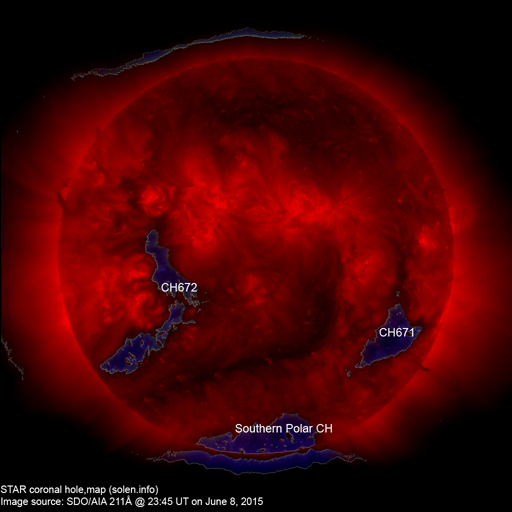 A recurrent trans equatorial coronal hole (CH672) will likely rotate across the central meridian on June 10-11. The geomagnetic field is expected to be quiet to unsettled on June 10 due to effects from CH671. Quiet conditions are likely on June 11-12. Effects from CH672 could cause quiet to active conditions on June 13-14.